I was just talking about how amazing the weather was, 65= in Novemeber?! So nice. Well folks....I think it is over. Yesterday was a balmy 35 and windy (so it felt so much colder!)!!! I think that last hoorah of decent weather is over ....til like April! SOB!!!! I am loving how lately with some 'editing' you can find items that look like their fancier retailer counterparts!! Items like these, that I wouldn't' see myself years season after season, I'm all about the saving!!! I can get my lamb sweater at a fraction of the price! And I am sorry the fox is just too cute! Ripped up jeans, plaid shirt under, boots and a parka?! Or what about with a wool pair of slacks in a lighter camel and a white button down, for the office?! OK, I love those cute sweater, the one with the lambs are just too cute. I know right!!! I may have to walk down on my lunch break!! Plus ON alwys has crazy sales! 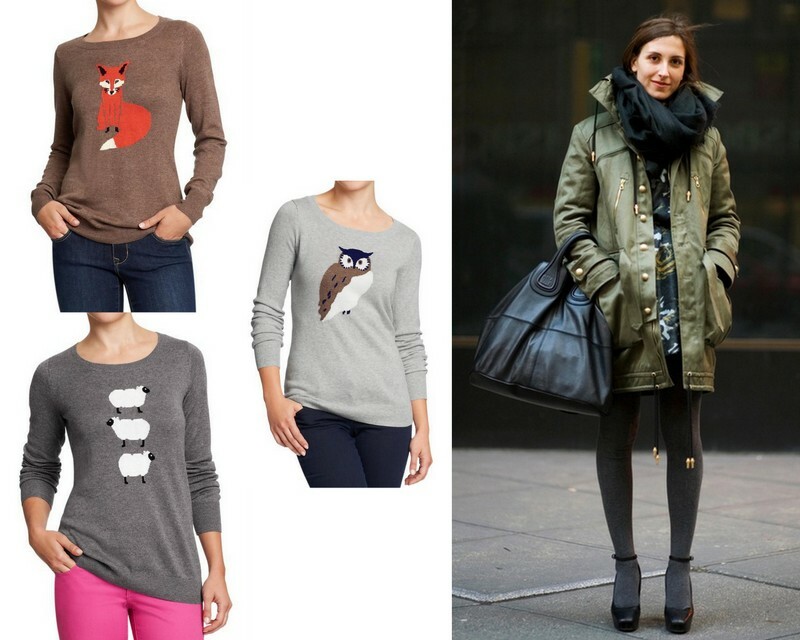 thanks for letting us know that Old Navy is now rocking animal sweaters - great find! Wrap up in a sweater and a gorgeous trench and hunker down for winter. I'm still trying to just be able to wear a sweater here in Texas. Take advantage for me! Oh girl....soo mean! It was 25 this morning on the way into the office! Seriously. I'm freezing already in Indiana. Love that fun hat! Fox sweater. I've been holding off going into Old Navy because I know I will find too many 'saves'! I'm torally with you on this (and busting up on the title of your post). Why pay a ton for a trendy item when you can get the same thing cheaper? In a word: FOX!! As I sit here sweating...I'm kinda jealous! Just scored a hat like that for the lil' lady bean!